In essence, it is a statement on hou Scotland will breenge doon its ain gait o internationalism efter Brexit. The statement says that will big up connections wi aa the wee countries on oor ain latitude an aboon sae we can share experience an expertise oan aahin fae culture tae land management an energy policy. The report sets oot whit we may learn fae the countries aa aboot that airt. The countries are the Baltic States o Lithuania, Latvia an Estonia as weels the Nordic countries o Norway, Sweden, Finland, Denmark an Iceland. Fitba heavyweights The Faroe Islands get a wee mention an aa. Ah’d encourage ye tae hae a keek at the statement itsel. Its nae owre lang an is gey interestin. 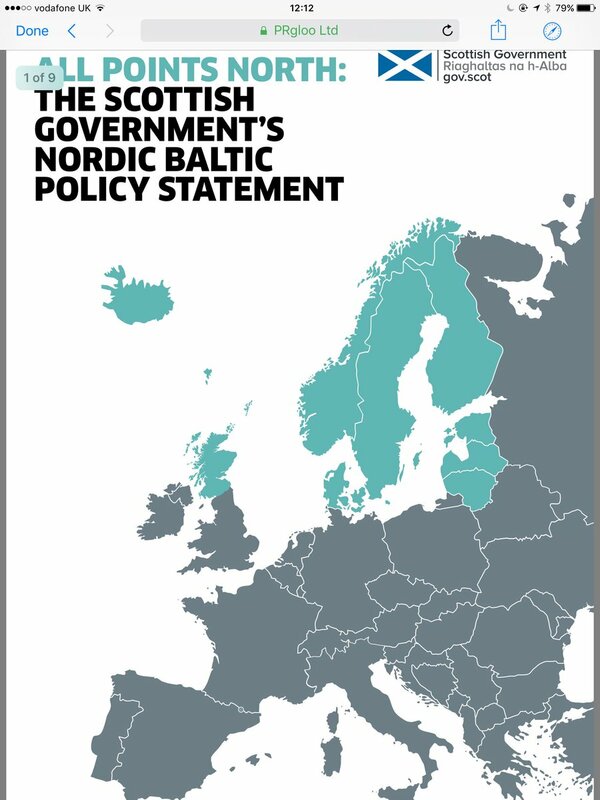 In this airticle Ah’ll wale just twa notable achievements by oor Nordic an Baltic pals that could be usefu tae us here at hame. It may surprise ye tae ken that Estonia is the maist technologically advanced country in the warld. Aye Estonia. The totty wee shouder o laun atween Latvia an Finland, wi a population o 1.3 million. Ane o the mair inspirational o their digital advances is their use o Tech in government. In Estonia ye can vote, pay taxes, sort oot permits, sign documents aa online in ae single system. Imagine the increase in voter turnoot in Scotland gin aa ye hud tae dae wis click oan an app? The government could gie ye notifications “mind it’s the cooncil elections the day, here’s the candidates in yer airt, awa an wale ane the noo”. Wee clickable profiles o ilka candidate wi links tae their promo videos an manifestos. Tommy Shepherd MP is richt ahint sic an idea. No ainly wid voter turnoot ging through the roof, but aabdy wid be that bitty better informed an aa. Braw. Estonians also hae the opportunity tae learn computer codin fae the age o seeven. Its hard tae credit hou obsolete the average Scot will be, wi oor basic Microsoft Office skills, when Estonians are bringin sic a fouth o digital skills tae the mercat. Finland has aaready gied us the braw idea o baby boxes. These wee cardboard boxes hae received aa the press they need sae Ah wilnae rack owre the coals. (guid airticle gien mair detail here). Anither idea Ah’d tak owre fae the freenly Finns richt noo the day wid be their approach tae Summerhooses. Accordin tae a recent European Environment Agency report, aroon eight hunner thoosan Finns hae access tae a faimly summerhoose, aroon ane in ilka seeven Finns. Spikk tae ony Finn an maist will hae happy tales o getting oot o toon an city tae bide owre the simmer in their ain faimlies wid hoose. It gies bairns a chance tae connect wi nature, an parents a chance tae disconnect wi wark an Wi-Fi. Scotland is millions an billions o miles fae haein onyhin like this. But the journey o mony miles aye maun begin somewye, an as o July 1st 2017 thon journey could be said tae hae begun. A new type o regulation wis pit in place fir ‘huts’, wee wid bothies. These bothies are noo mair lichtly regulated than afore, an can noo spring up aa owre the laun wi bit mair ease. But it’s a sair fecht tae bring somethin intae existence if it isnae pairt o yer mental grammar. Sae the livin, breathin exaimple o a healthy hut culture owre the watter in Finland should act as a template as we ettle tae rejuvenate oor connection wi the laun that aince wis oors. The statement is clearly just a stert. Hae a read through the document, an ye see that hail chunks o it are thinner nor the skin oan auld mulk. Whiles oor ambitions fir wark wi Norway are lang an varied, the stated pairtnership aims wi Latvia are pit in ae single bullet point, essentially tae “explore new opportunities for bilateral engagement… ”. Thon’s no exactly arguin fir the biggin o a post-Brexit information superhighway atween the twa nations. The value o the statement isnae necessarily its contents but. Its value is that it spikks tae the value o haein a separate, independent heid oan the Scottish government. A heid that can look aboot itsel, unnerstaun wha an whaur it is in the 21st century, an ettle tae act in accordance wi that unnerstaunin. As Brexit Britain struts aboot thinkin its Airchie, a kenspeckle pooer fit tae staun alangside the EU, the US, an the emergent pooers o China an India, its makin a fool o itsel. Scotland kennin that it has mair in common wi Estonia, Latvia an Finland is gey usefu psychologically… We hae a culture, in need o nurture, that’s equal tae ony o them. We struggle wi sma populations, the exodus o the young, an the tribulations o bein a wee voice at the noisy stramash o international affairs. We excel at opportunities fir renewables, fir academic research an institutions o learnin. We hae a radical, inclusive mindset that’s strang enough tae confront the richt-wing aggro that’s comin oot o certain Nordic states the noo. We hae a contribution tae mak, an mony lessons tae learn fae oor Northern neebors. This is the richt gait, noo we should wark tae gang doon it. It may be very nostalgic to write in terms of “hae a wee keek” etc., but if we want to encourage a truly inclusive society in modern Scotland with maximum participation from everyone don’t you think your articles should be written in language that everyone can easily understand? Ehm… Ah’m shuir ye dinnae mean ony hairm bi it… But arguin taewarts “an inclusive society” bi proponin the daein awa o onythin different fae the norm? D minus, must dae better. Maist Scots fowk unnerstaund Scots nae bather, thay juist hae tae lairn thon wuirds tae read an screed thair ain mither tung. Maist Scots are noo bi-lingual, thay juist dinnae ken it – primarily because the BBC, the British state and its institutions including schools and universities, and ignorant people like you tell them otherwise. Our Scots language, Ian, is as close or even closer to numerous other European/Germanic languages as it is to English. Continued cultural oppression is a fact of life in a British state which refuses tae lairn oor bairns an aw fowk thair ain langage. And the consequence of this is that the ignorant fowk we invite here to lead our institutions think we speak bad English. This ongoing cultural oppression can only be rectified by a Scots Language Act. Most English speakers understand it no bother. Its just they cant speak it and nobody agrees on what it is. “Our Scots language, Ian, is as close or even closer to numerous other European/Germanic languages as it is to English.” Eh? Yes there are words, phrases and aspects of grammar that have been influenced by other languages but closer to as close to other languages as it is to English? Thats stretching things to say the least surely? Ah’m aye chavin tae mak Scotland mair inclusive min, thon’s the gemme in a nutshell. Hou wid it be an inclusive society gin we didnae hae aa the Scottish leids in it but? Ken whit ye mean oan the “stannart English” argument. The issue wi that is leids (languages) are the banes that the meat o cultur is strappit oan tae. Gin ye dae awa wi ae leid, then a hail wheen o cultural norms, wyes o kennin aboot the warld, certain philosophies, ging doon the sheuch wi it. The bairn wid get very much bunged oot wi the bathwatter. So naw, the leid maun live. Thats back to front, you get people to learn the language by using it for important matters. I’d love to see a collection of ballads and songs which are found in both Scotland and the Baltic countries. There’s so much shared repertoire within the tradition. For example… The Fause Knight Upon The Road has three versions in Childs English and Scottish Popular Ballads Volume 1 (A, B and C). There are 10 texts with tunes in Bertrand H Bronson’s collection. The song is found in William Motherwell’s Minstrelsy, in the Mitchell Library in Glasgow. The Cause Knight is Roud #20 and Child Ballad #3. The Fause Knight is a classical ballad; the devil will carry off the boy if he can nonplus him, but the boy always gets the last word and has an answer for the Devil’s questions. Cheers! There’s a hail skelp o that that went owre ma heid, but as far’s Ah unnerstaun it, ye’re sayin there’s a guid chance that cultural interaction atween the Batlics states an here widae meant that we share balladry an folktales? I mind Billy Kay haein some chat aboot how theres Russian versions o the Twa Corbies. Be unreal tae hae aa the shared Baltic/Finno Scandinavian/Scots sangs aa gaithert thegither in ae sang book. Ye free tae dae it yersel Iona? Execlellent article!! As a Latvian Scot, I could think of nothing more progressive and exciting for all involved. Our similar cultures meant that we received our welcome and felt most at home coming to Scotland more than ten years ago! Scotland is itching to become leaders in environmental and social standards and by following many examples set by our good friends the Nords, this can most certainly be achieved and I welcome it! How bonnie! More of this! Braw airticle as aye, Ally. Gin we can anely relate tae ither nations throu the prism o the UK, we’ll hae tae thole some dreidfu cultural malnutrition. Awready hiv. We need yon kind o gie an tak wi oor ither neebors an freends tae find oot wha an whaur we are oorsels. An hats aff tae Estonia’s eGovernment notion. Yon’s the kind o concept that’d fit awfie weel wi the ideas o citizenship that ah think we’re developin here. Thank goodness. At last someone writes in Scots that I understand – even if I couldn’t write it. This is the Scots of my childhood! Like the content too! We’ve a lot to learn from the Scandanavian nations but we can learn from the southern Europeans too. I might have felt angry about how the Catalonians were treated on Sunday but I did feel very proud of them. Catriona, glad ye enjoyed the article. How no hae a crack at writing in Scots? Start chuckin in a wee “this is braw” when ye’re haein a cup o coffee wi a pal. Wark up tae pittin “yours aye” insteid o “yours sincerely” at the fit o emails. Stert seein how it feels tae text somebdy tae say ye’re scunnert insteid o dissapointed or sair-heidit insteid o hungover. Very informative piece. Beautifully written. Perfectly understandable. That’s basically the sort o review Ah’m aye efter. Cheers big man. We’ve opened a company in Estonia already (see “estonia e-registration” in Google) to operate from if Brexit goes through – we already have a big customer base in the Eurozone from a Scottish-registered company we’ve been running for over 21 years. An aside on the countries highlighted in the map: Poland is missing! There is also great potential for trade with Poland via Gdansk, as has been the case for centuries. Poland is ane o ma favourite countries an Ah’ve spent loadsae time there. Sadly, they’re haein a very weird time politically. They seem tae be flirtin wi a gey different sort o Nationalism tae wir ain. They arnae a state we’d want tae be getting insnorlt wi the noo. No at aa at the vanguard o aa thats guid an modren an progressive? At least, that’s how Ah’m seein it, ye may hae better inights than masel?